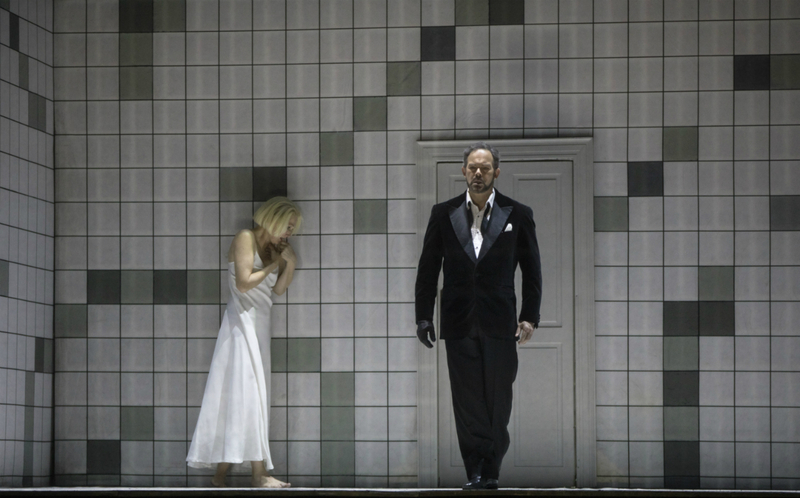 To see or not to see: that’s the question posed by Metropolitan Opera’s intriguing pairing of Iolanta and Bluebeard’s Castle. The eponymous princess of Tchaikovsky’s opera, blind from birth, has been zealously shielded from the harder truths of her condition by her father; when love, and a magically gifted Moorish doctor, ‘cure’ her, she’s initially overwhelmed, unsure whether this extra sense is blessing or curse. Bartók’s newlywed Judith can’t resist asking her secretive spouse just what’s behind those seven locked doors; seeing the once unseen proves her undoing. 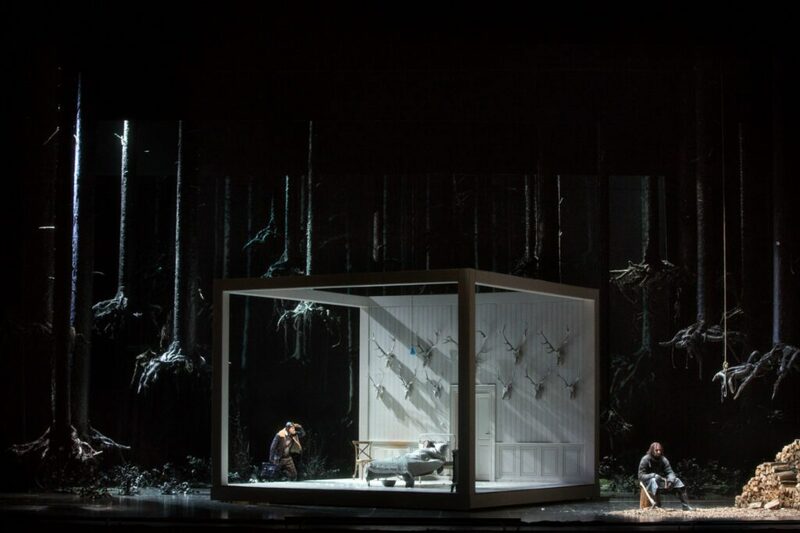 Mariusz Treliński’s production, introduced to the Met in 2015, may try a little too hard to link the two works in ways other than the obvious (set designer Boris Kudlička’s gloomy forests and boxy, stag’s-head-laden interiors feature in both), but on his terms each makes its points effectively, even if they’re in closer sync with the post-intermission matter at hand than with what preceded it. For Treliński’s Iolanta—more prisoner than pampered princess—sight offers little more than achromatic brightness, though there’s plenty of musical colour to suggest a different—and, I think, more appropriate—stage world than his; after all, Tchaikovsky’s opera shared a premiere with his Nutcracker, and a touch of prismatic fantasy wouldn’t be misplaced. For Bluebeard, Treliński and his design team were on more congenial ground, with Bartek Macias’s eerily motile projections and sound man Mark Grey’s amplified creaks and groans doing their part in visually evoking Bartók’s seductively spooky house of horrors. Casting was strong on both sides of the interval. 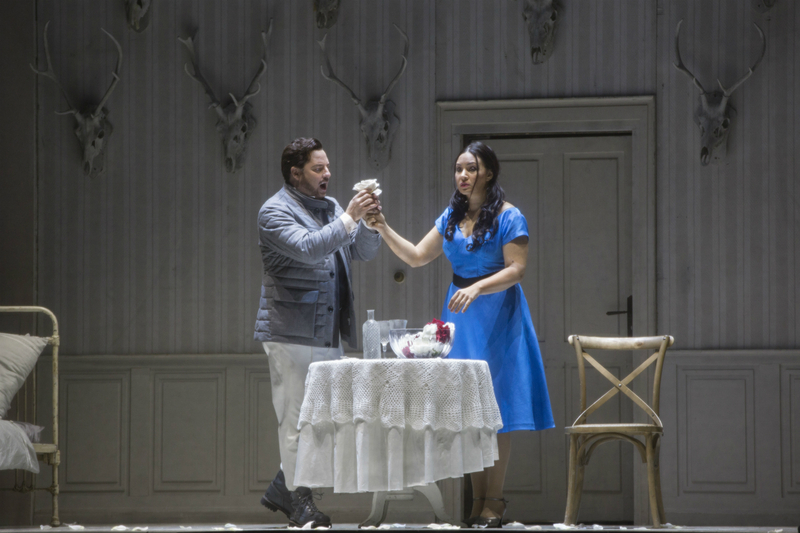 As Iolanta, Sonya Yoncheva seemed, vocally and temperamentally, right at home: though the topmost notes remain chancy, the generally plush tone and unaffected delivery served the role well. As her overprotective papa, King René, Vitalij Kowaljow balanced her with some firm, handsome vocalism that faltered only at the end of his aria, where the music dipped uncomfortably low. Matthew Polenzani, as Iolanta’s truth-telling suitor, seemed fully recovered from the indisposition that kept him from the revival’s opening night (this was its seconda, on Jan. 28th): ardently lyrical, and sounding wholly idiomatic in his first major excursion into Russian repertory at the Met. 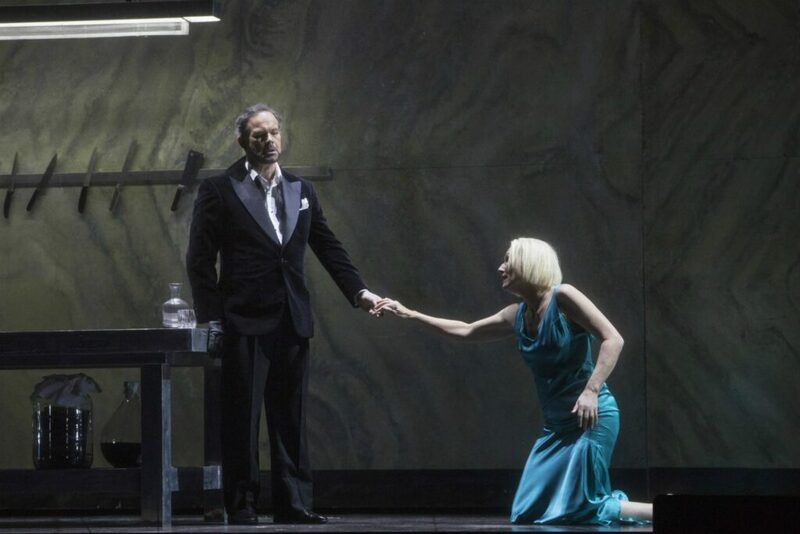 Alexey Markov (Robert) and Elchin Azizov (Ibn-Hakia) sang their solos strongly; and Harold Wilson and Larisa Diadkova made sturdy contributions as the princess’s husband-and-wife guardians. Conductor Henrik Nánási expertly extracted from Tchaikovsky’s score the Nutcracker-like palette we weren’t seeing replicated onstage. He did still better with Bluebeard’s Castle. There’s something that native Hungarians like Nánási bring to this music—Fricsay, Ormandy, and Kertész (on record) and Solti (live) are others I can easily name; it’s an intangible rightness-in-the-moment that goes well beyond a word-by-word comprehension of the text. None of their readings have sounded the same, but each has seemed, in its unfolding, exactly the way to go. Nánási has a wonderful feel for both the individual moment and the music’s overall pulse and thrust (surely a challenge here, with the many Treliński-imposed stop-and-start intrusions on musical continuity); this was easily the most arresting account of the score I’ve heard at the Met. Angela Denoke and Gerald Finley were the unhappily-ever-after couple, two veteran but still-potent stage animals fully committed to their director’s vision. Denoke may have fudged a favorite moment of mine—that “Christa Ludwig moment,” the exposed high C at the opening of the fifth door that Ludwig nails with such thrilling authority on Kertész’s recording—but she sang well and acted with a fierce grace. Finley wasn’t helped by certain Trelińskian quirks—singing stretches of his role, for instance, invisible and amplified, compromising the effect of his voice when he reappeared. Unenhanced, his Bluebeard sounded darkly warm and elegantly nuanced, and—along with equal parts menace and smooth allure—he brought to the fore a quality unique, in my memory, among onstage Bluebeards: an aching pathos. Unique, too, was the audience’s reaction at curtain fall: a full seven seconds of utter silence. The many who left the house after Iolanta missed the better part of the show.